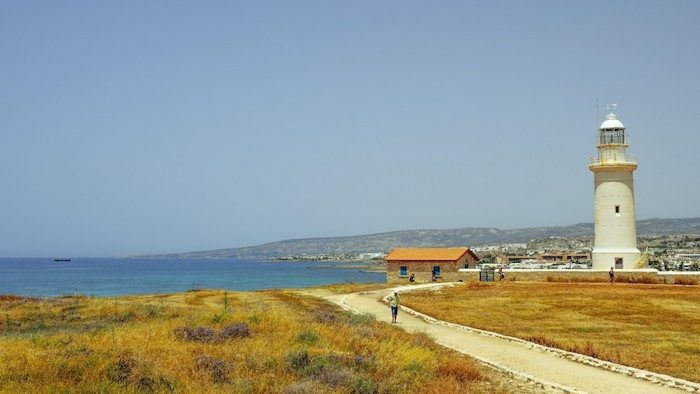 A wonderful coastal boardwalk path runs along the Mediterranean on the western side of Cyprus, in Paphos. There are great views of the water, and several scenic and important sites nearby. The south end of the path starts at the Medieval Castle of Paphos, and goes for 3.6 km north to the Venus Hotel, for an out and back of 7.2 km (4.5 miles). Sites along the way include House of Theseus, the Paphos Mosaics, the House of Dionysos (restored Roman Villa), Odeon architectural ruins, and the Tomb of the Kings. Much of the route follows Lighthouse Beach (Faros Beach). Surface type varies. Some sections right along the water, others a bit above it. Great sunsets! There is also a decent path/sidewalk heading south, from the Paphos Harbor as far as the Luna Park, for about 4 km. Some sections are bona fide boardwalk, while others are more beachside sidewalk. Most of this is right along the beach, where you can vary your run by doing some of the section on sand! The beach itself is fairly wide and runnable, especially near the water.